I like to think there really is a movement to bring about intelligent literary work in the old horror genre which for far too long now has been flooded with imitation ideas and stock characters. I would be glad to see the back of the zombie, the werewolf and the vampire in their classical forms. Nothing could be more tedious than these fanged, clawed and half-dead hairy things. And I don’t at all mind if it’s called something else like the new weird or the new black, just as long as we can begin to see good writing, as these days – with the changes in the publishing world perhaps – there seems to be an ocean full of books written by people whose use of language is flat and one dimensional. When you think about it, if you don’t have the control of language that Nicolay has, how can you thrill, intrigue or terrify the reader however good your story idea is? Because it isn’t the hideousness of any monster we might invent that does the trick, but the use of agile and imaginative language about that creature. I have the book in front of me now, a very handsome hardback with a beautiful red- coloured book jacket and published by Fedogan and Bremer. A further pleasure is that the book has a sprinkling of mysterious black and white curious illustrations by David Verba that could be paintings, etchings or drawings. Nicolay is just as masterful at creating inside settings that give you the creeps in much the same way as his fantastic outdoor descriptions do, as in this about a motel room in his story ‘Phragmites’:- ‘Big holes in the dirty curtain pinched closed with safety pins. Cobwebs. No TV, but the useless cable lay coiled on the carpet. No door on the bathroom, just forlorn hinges hanging in the stale air…. Seven dead roaches on their backs in the shower, garnished with a scatter of brittle moths and flies.’ This story begins in a bone factory beneath a museum of anthropology, and as in maybe all of his other stories, the author from time to time, gives small and interesting side stories as remembered through his characters about landscape or history or sociological matters. Again in ‘Phragamites’ there is fantastic attention to the physical details of the landscape. I’ve always thought we don’t need to create ‘fantasy’ settings for our dark stories as things monstrous are all around us in our real life, and stories set in believable settings are far more terrifying. Nicolay’s settings are evidently actual, or built from memories of the actual. 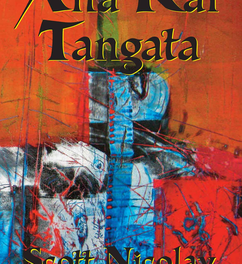 He introduces the reader to archaeology, geology and anthropology – jungles and caves come into his stories so that sometimes it’s like reading half ‘gothic’ half adventure. 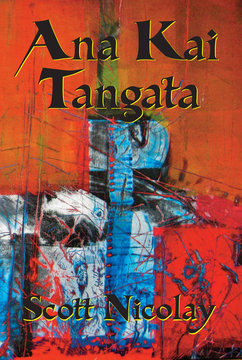 This book is not a throw-away paperback, but a handsome volume, and although, like me, you may not be in the habit of collecting hard-backs, in the case of Scott Nicolay’s ‘Ana Kai Tangata,’ it is more than worth the investment by a long shot.